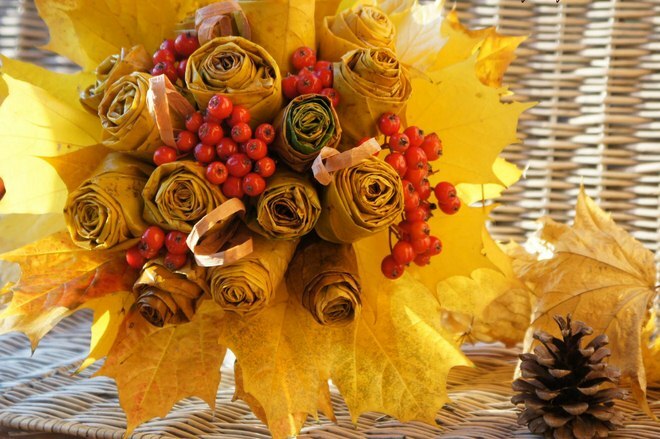 Fall leaf crafts offer you the easiest way to bring these brilliant autumn colors into your home! 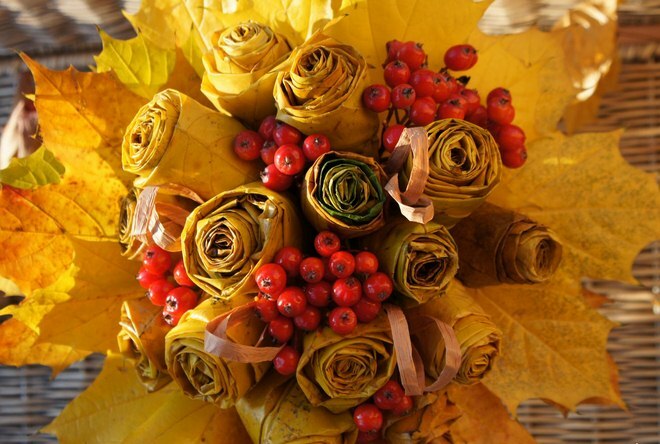 These warm reds, yellows and browns can sprice up your tablescape at Thanksgiving or add a little touch in a dull corner. 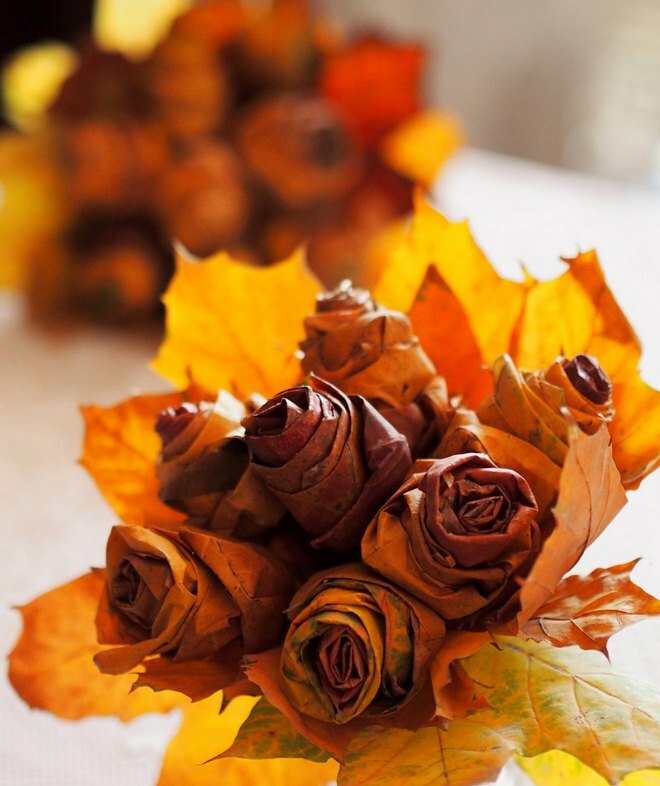 You can use these amazing maple leaves roses into your bridal bouquet, as well. 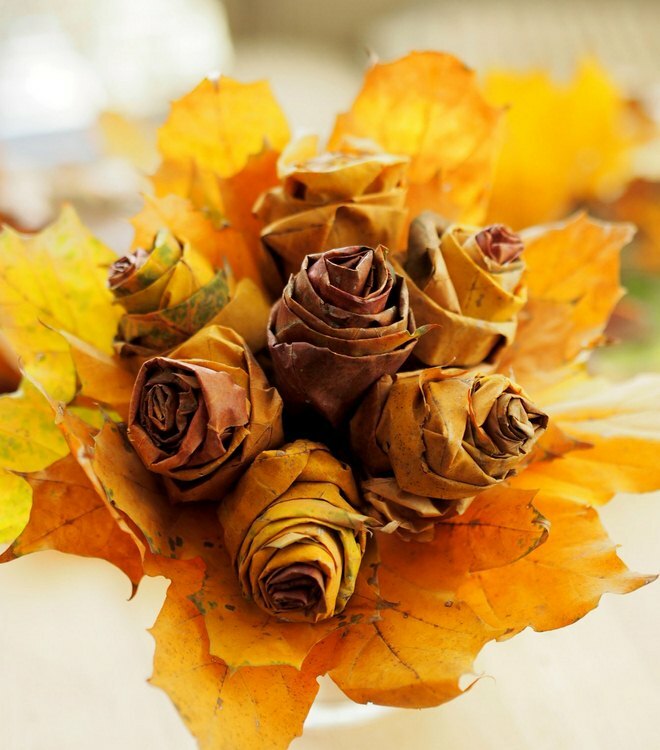 Let kids help you making this pretty maple leaves bouquet and let them learn new things about nature, trees and the autumn season. 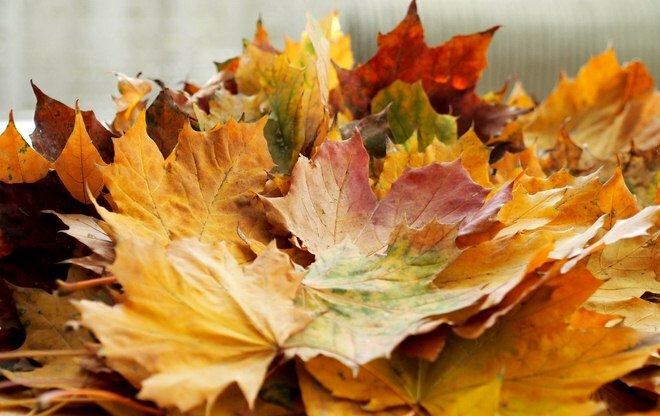 – maple leaves in various colors and sizes – The leaves should be soft and pliable, not too dry because they will crack when rolled. 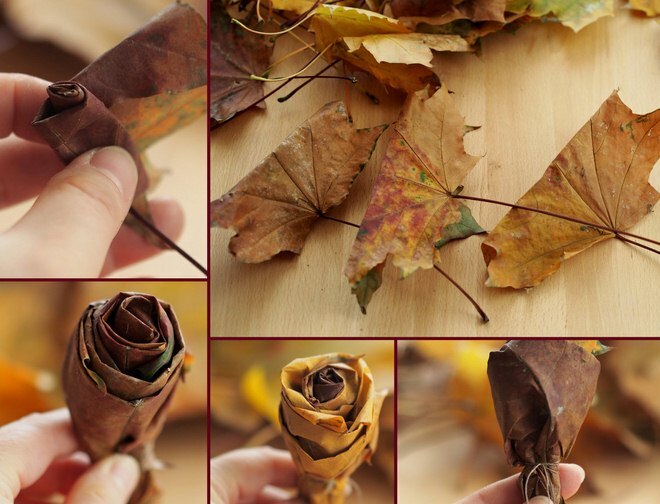 Fold each leaf in half, the colorful side to you, as shown on the photo above. Start folding carefully at one end. After you’ve folded the whole leaf in a tight roll, take a second one and wrap it around the “bud”. Continue adding leaves by placing them on different sides to get an even size. Use larger leaves on the outside and make sure it’s not too tight. The number of the layers depend on the size of the leaves. After you’ve reached the desired size, secure the stems and a wooden stick with a piece of string. Make several roses, gather them in a bouquet and make a border around them with some more maple leaves. 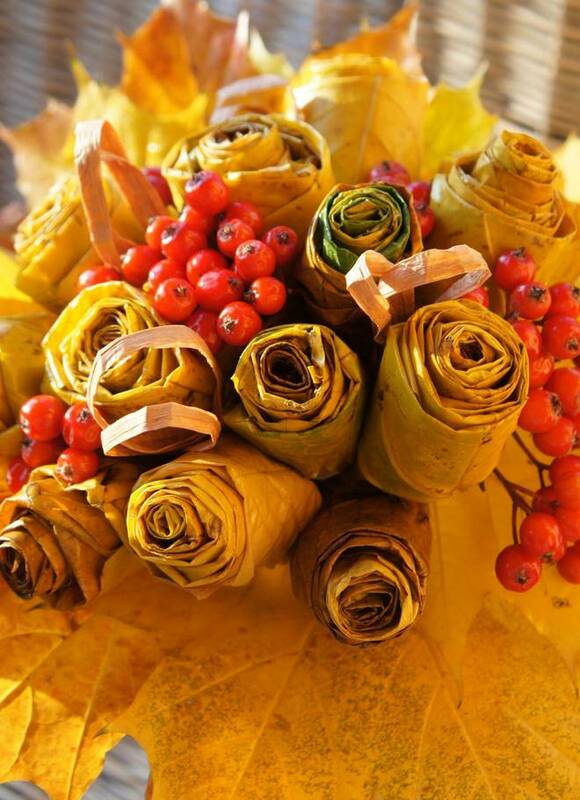 Wrap the stems by using flowers tape. 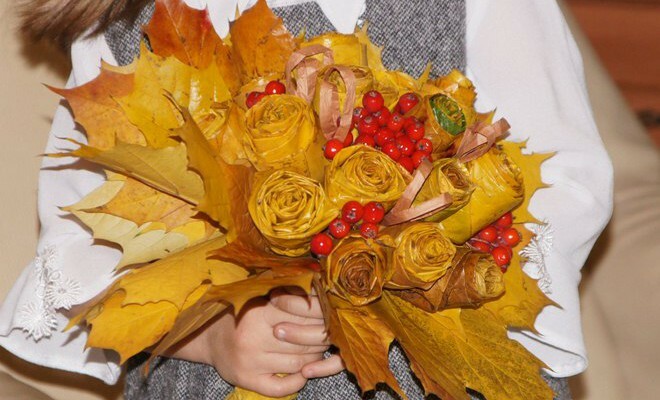 Your fall leaves rose bouquet is ready! Now you can put it in a vase (without water) or give it to someone you are fond of. After a few days the leaves will dry but still look beautiful. 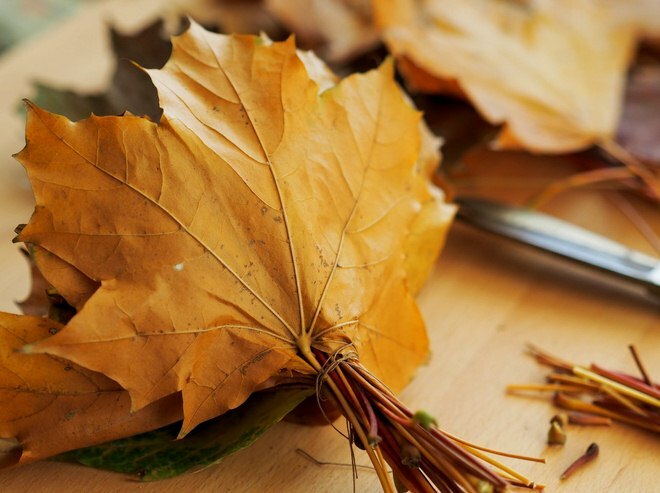 To keep your maple leaves lasting longer, spray them with a little hairspray or brush them with vegetable oil.